There are certain factors that prevent us from driving a car with a trailer, certain factors and how to overcome them will be thoroughly discussed in this article, to give you the know how if or when you want to drive a car with a trailer. There are many complexities found when driving a car with a trailer safely. Though some may think ‘As long as the trailer is firmly attached to my car I’m fine!’ No, sir/madam, you’re not! So if you want to learn how to drive a car with a trailer safely then read on. One main factor that should be considered if you want to drive a car with a trailer is qualification. You must have acquired a B+E licence. Before you hit the road, you must make sure that the trailer is securely attached to your car – but as mentioned before, that’s not all there is to it – Firstly, you check that the trailer is connected to the hitch. For a normal hitch, the tongue on the trailer should be able to attach to the hitch of the car pretty easily and just snaps in place. Test the strength of the connection by pulling up on the trailer, if you are able to pull off the hitch then it must be reattached. Secondly, check the brake lights and signals, you do this by connecting the electrical wires from the trailer to your car. One precaution is to always check if the trailer works when you apply the brakes in the dark. It is paramount that the lights work as on the road other motorists are unable to detect if you are slowing down and in the dark, they can’t even see you at all. 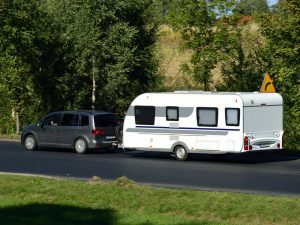 The weight of both the caravan and the car is important if you want to ensure a safe journey. The car must be heavier than the trailer so it can easily pull the trailer along and retain control of the trailer. The ’85 rule’ recommends that the trailer doesn’t weigh more than 85% of the car’s kerb weight when loaded, this rule is not legislated but it is great advice! Driving forward with a trailer is easy enough, but there are still some things to consider. When taking corners, take them wider than usual by driving further forward before swinging round, if not the trailer might possibly cut the corner behind you, which can lead to bad accidents or worse. Make sure there is a lot of space for braking and brake more gently. Reversing with a trailer, so this is the fun part. Reversing a trailer takes more precision and practise, there are a lot of advanced driving training services in the UK, in areas like Milton Keynes or Aylesbury to help you with this. First start with the car and trailer as straight as possible which makes it easier to reverse. Make sure you have plenty of room to swing the car round. Constantly watch the trailer outside of the driver’s window while reversing it, just to monitor it. Reverse slowly and turn the steering wheel to the right. When the trailer starts to turn, start to straighten up the car with the trailer whilst you’re reversing. Make sure you don’t do this too late as the trailer will ‘jack-Knife’ meaning the trailer and the car will become sort of like a ‘v’ making it impossible to reverse it then. Eventually start steering to the left, whilst reversing to bring the car’s nose round so it starts to ‘follow’ the trailer, but you still need to watch the trailer, to see where it is going just in case it requires correction. Reverse in a straight line while checking using the door mirrors. Reverse slowly, and when more of the trailer starts to show up in one mirror, steer towards that’s that mirror to steer the trailer the other way, these corrections only require small steering movements. And there it is! Thoroughly explained factors and tips on how to overcome them when driving a car with a trailer.